River Cottage and the escapades of Hugh Fearnley-Whittingstall remain one of my favourite cookery shows. 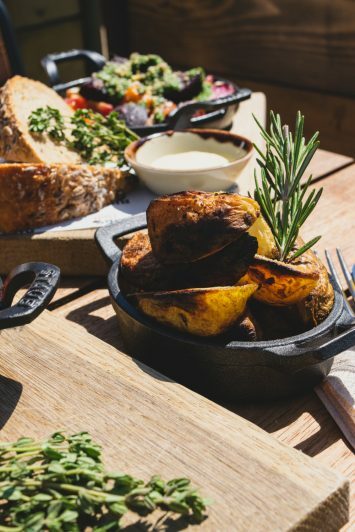 An idyllic farmhouse opening its doors to the general public to demonstrate a style of farming, cooking and entertaining that is sustainable, self-sufficient and more wholesome than an Enid Blighton novel. It was a TV show based on eating the seasons and taught you more than what to do with each divine ingredient, but rather where it came from, how to grow it yourself and how to put every fibre of it to good use – often finished off with a glug of homemade beer. Hearing of the opening of a River Cottage Kitchen and Deli at ZSL Whipsnade had my ears pricking up quicker than a meerkat on a termite mound. 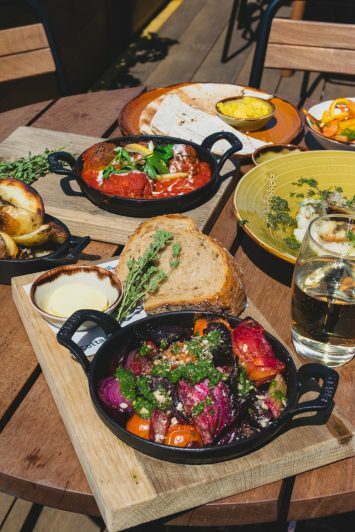 Their shared commitment to quality, sustainably sourced ingredients and materials was sure to make it the perfect eco-conscious eatery – and we were not disappointed. Last Thursday, I invited my animal-obsessed pal, Kharmen, on a surprise trip to ZSL Whipsnade. We were blessed with blue skies, scorching sunshine and gentle summer breezes as we pulled up in the carpark of what was once the Lookout Cafe. 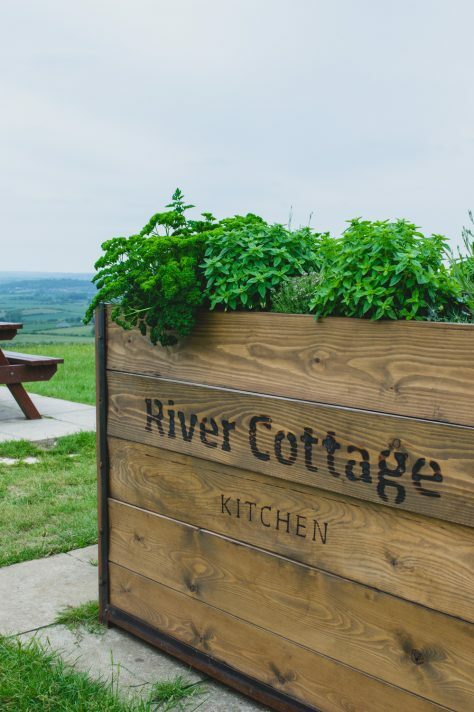 The new River Cottage Kitchen and Deli sits opposite the 24-acre Rhino enclosure with a panoramic view of the astonishing English countryside on the other. Its newly refurbished facilities are like a modern pantry – greys and glass meet wicker and wood. 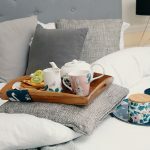 The zoo is full of fantastic family eateries and although the mature, contemporary feel of the new restaurant isn’t intimidating for them, this is definitely a part of the zoo where couples or older groups are more likely to retreat. We were greeted by the kindest staff (shoutout to Zena), who took a genuine interest in our plans for the day. We took our seats in the garden area and ordered some River Cottage EPA and Elderflower Cider – homemade and decent alcohol volume, bravo! The menu is certainly quality over quantity with only a small yet varied selection. I wanted to do my research, however – nothing to do with sheer greed – and so we ordered HARD. Commence feeding time at the zoo! 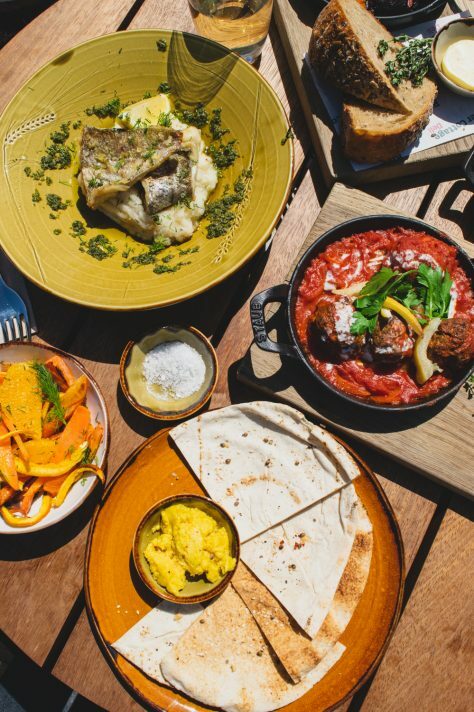 Grilled flat bread, organic hummus, hemp seed dukka – A deliciously rustic flatbread, slightly charred, to give a smoky taste to the overall dish. The hummus was coarse, colourful and nutty in taste. It was a little under seasoned for my palette, but a pinch of sea salt flakes (provided) sorted it out. 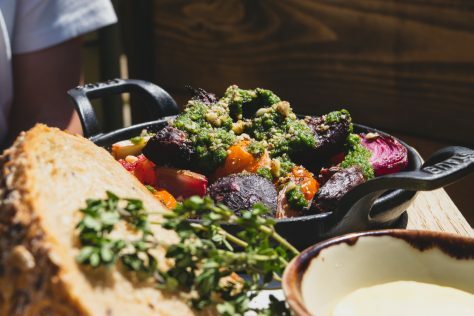 Grilled sourdough, beetroot caponata, roast walnuts, parsley pesto – Beetroot gets a bad rep because of its ‘soily’ taste. However, I adore the earthiness and bitterness of this beautiful veg. 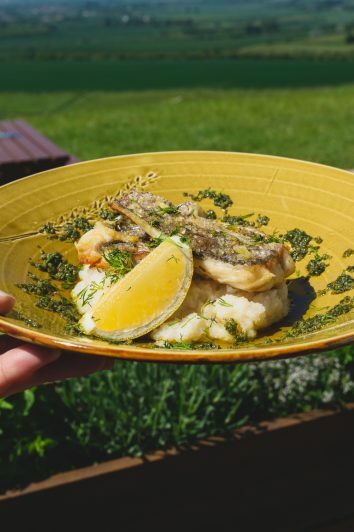 The dish unexpectedly included large chunks of fresh tomato and onion, all smothered in a bright emerald parsley that always adds that gorgeous grassy note to balance savoury dishes – it’s a transformation as alchemical as the way a little lemon juice can just make a dish sing. I didn’t notice the walnuts, so would maybe encourage the brilliant River Cottage staff to be a little more generous in that department. 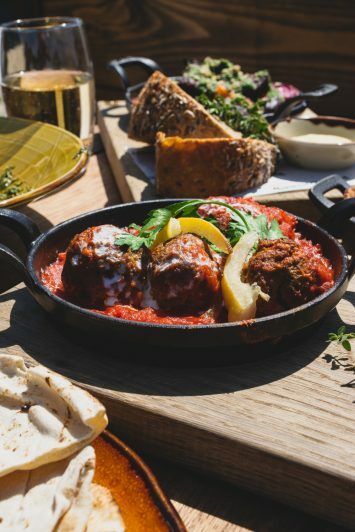 Wood fired organic lamb meatballs, preserved lemon, yoghurt – Mildly tart but intensely lemony, the sweet lamb meatballs were balanced with a rich, smoky tomato sauce. The sour yoghurt helped to eliminate the heaviness of the dish and made it surpisingly light for a Summer’s day. Wood fired Cornish hake, smoked celeriac, seaweed tapenade – Sustaining and sustainable hake deserves a place on our menus more often. Part of the cod family, it has that familiar meaty taste, but a tad lighter and sweeter. This dish was cooked to perfection, with the flakes falling apart and melting in your mouth. It was a generous portion and an obivous brain child of Hugh’s as the seaweed tapenade rang familiar. It’s in his ‘Much More Veg’ book and is a simple combination of seaweed and kalamata olives. Its saltiness enhanced the flavour of the Hake with a brilliant umami punch without overpowering it. Wood fired potato chips, rosemary sea salt – It’s important to give honesty and balance in a review and for me, the potato chips were a standout weakness. They were too soft, under seasoned and bland. No joyful taste of rosemary and no crunch. I wouldn’t order these again. 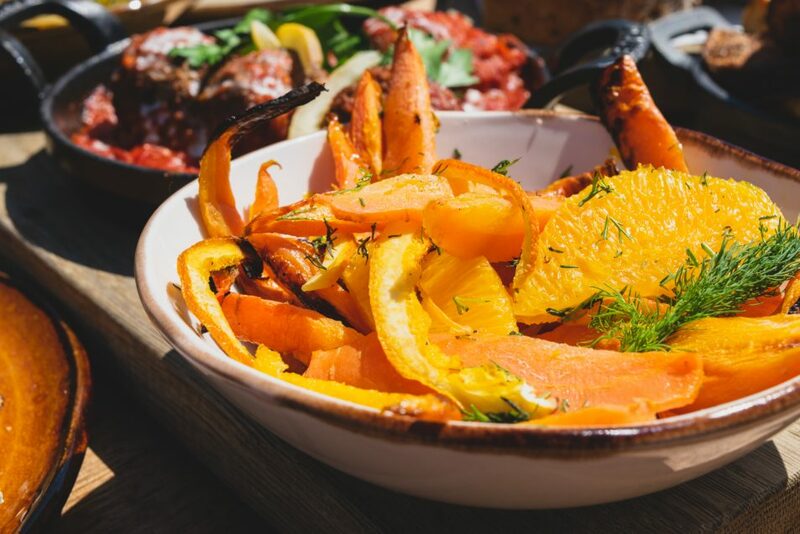 Roast carrot salad, orange, dill – What a revelation! I loved how the sweet citrus of the orange brought out the honeyed taste of the carrots. Dill is one of my favourite herbs, too, and wildly underused – it was lovely to see it on a menu. It brings the dish notes of fennel, anise and celery, with warm, slightly bitter undertones. Beetroot & chocolate brownie, organic cream – Firstly, you cannot taste the beetroot, and for most, this is a brilliant thing. The beetroot adds antioxidants and nutrients without sacrificing taste. They’re most commonly used in chocolate desserts because they add moisture, yet the cocoa powder and chocolate mask any possible subtle earthy flavour. The beets in this particular brownie add so much moisture that the cake becomes thick and rich and gives that ‘underbaked’ texture that every brownie maker strives for. Admittedly, we were defeated by its size, but the extraordinary Zena (River Cottage Princess) popped it into a take away box and not a scrap was left by the end of the day. 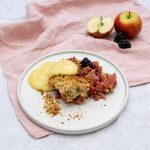 Hazelnut Pavlova, roasted apples, custard – This dessert didn’t need the pavlova as the apples and custard were the dreamy stars of the show. Personally, the meringue didn’t sit all that well with the dish and was too much on the crumbly, powdery side with not enough chew. The apples, however, had an almost rhubarb taste to them, and when married with the canary yellow custard gave a nostalgic taste of boiled sweets I would get from ‘Phil and Sue’s News’ corner-shop. Absolutely excellent. Overall, the food celebrated freshness and quality. Though a little underseasoned for my tastebuds, the portions were generous, the care and attention to each dish was faultless, and although the price tag is significantly higher than other places at the Zoo, it was relatively well justified in the nature of the produce. All in all, would I recommend? Absolutely. The restaurant is only available to visitors of the Zoo, and that for one is an experience I couldn’t sing highly enough about. 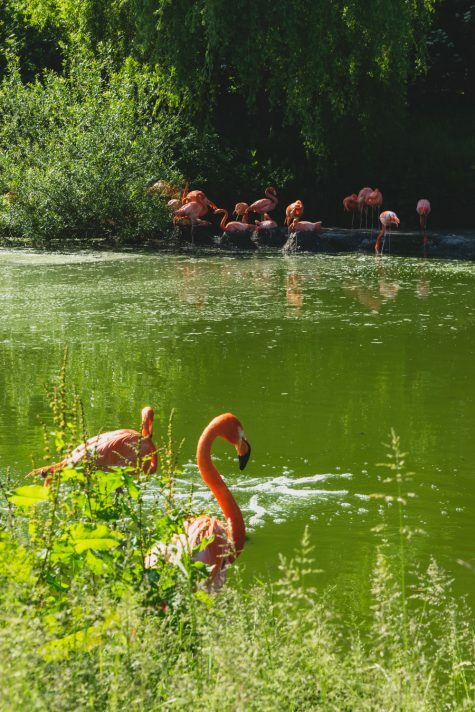 As the UK’s biggest Zoo, ZSL Whipsnade is home to more than 3,000 animals of 187 species and welcomes more than half a million visitors each year. 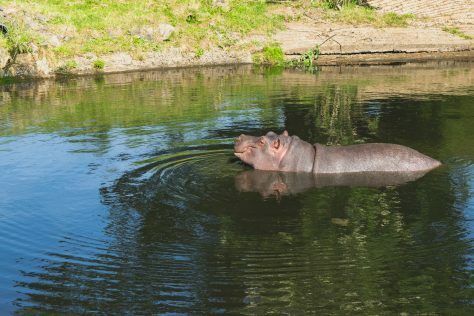 Every penny made by the Zoo gets fed back into the ZSL charity. That’s right, ZSL Whipsnade and ZSL London are charities. Founded in 1826, the Zoological Society of London (ZSL) is an international scientific, conservation and educational charity whose mission is to promote and achieve the worldwide conservation of animals and their habitats. I have been lucky enough to have a really good insight into what they do and can vouch that their tireless efforts are giving us a real chance at security the world’s wildlife for the future. A chance we desperately need.